Dropping 192 metres at 85kmh was a “terrifying” but feel-good experience for Kelly Peterson. 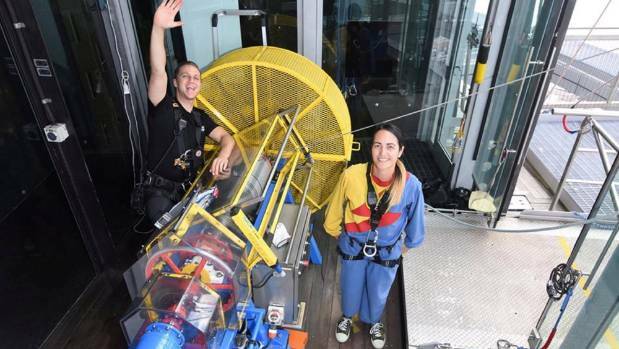 The deputy principal of Papakura High School was one of 29 bosses that plunged off the top of the Sky Tower in the recent Drop Your Boss event. It’s run each year by the Graeme Dingle Foundation to raise funds for its varied education and support programmes for young children and teenagers. “I was absolutely terrified,” Peterson says, about standing high on Auckland city’s skyline before jumping attached to the descent wire. uirements, she got changed into the special skydive suit and was put into the harness, during which she felt “very nervous and anxious”. Share the post "School boss jumps off Sky Tower to empower youth"